These tables list the order books Adam4EVE has currently imported and how long this import is ago. A4E imports the public orders books of all regions and then adds the individual public order books of the known structures on top of this. The order books of hub regions and structures are being imported more frequently than all the other order books. 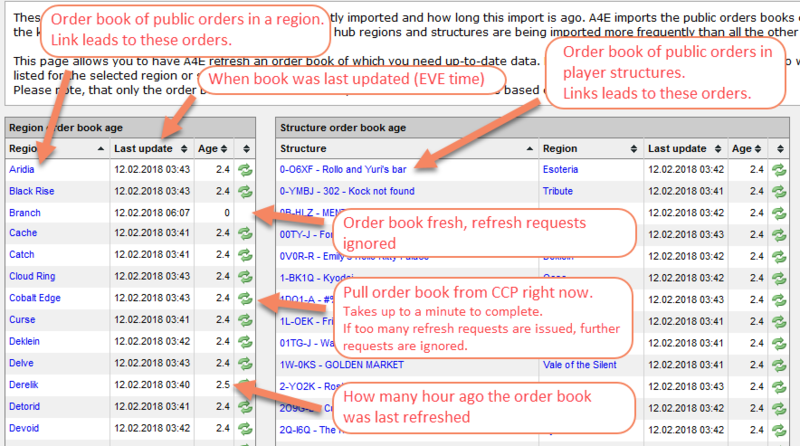 This page allows you to have A4E refresh an order book of which you need up-to-date data. By clicking on the refresh icon you'll have to wait a moment until the update is complete and the import time listed for the selected region or structure has changed. Please note, that only the order book is refreshed. Not any calculations and statistics based on the refreshed order book!